People with type 2 diabetes need ongoing treatment and regular monitoring maintain normal or near-normal blood sugar levels. Treatment has medications, self-case measures, and lifestyle adjustment, which can minimize your risk of diabetes and other complications. So it is vital to find out how specific foods affect our diabetes. The Carbohydrate content of foods can be hard to estimate unless you know what food contains carbohydrate first. And it is actually closely linked to the blood sugar influence. Vegetables and fruits are mostly carbohydrate, although they have small amounts of protein and fat, but tomatoes and many vegetables are low enough in carbs that you can enjoy them without too much concern about their portions. You would like to know what kind of fruit can a diabetic eat. A medium tomato, which weights about four ounces, contains just 5 grams o carbohydrates and 22 calories. 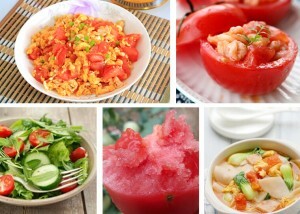 1 cup of diced raw tomato has around 7 grams of carbs. This is similar to the level revealed in most vegetables as well as much lower than the carbs found in fruit, pasta, bread, and starchy vegetables like corn or potatoes. The confusion about ‘vegetable’ and ‘fruit’ arises because of the difference in usage between cooks and scientists. True, tomatoes are classified as vegetable, there are no argue about that in my mind. Tomatoes are a good source vitamin K, vitamin C, manganese, potassium, fiber and low in calories. They are also riche in lycopene – a plant chemical known for their antioxidant properties. Intake of tomatoes has long been linked to our heart health. Fresh tomato extracts and tomatoes have been shown to help lower our triglycerides and cholesterol. You will get sugar from any kind of vegetable or fruit. The majority of the calories in tomato come from sugar. Actually a whole large tomato, which weighs about 6.5 ounces, has more than 4.78 grams of sugar. Tomatoes come with two primary kinds of sugar: glucose and fructose. Sugar is simple carbs that digests quite quick in our gut. Glucose and fructose and some other sugars, rapidly enter our bloodstream, providing us energy if our blood sugar levels drop. Controlling your blood sugar levels is a very important part of our diabetes management. Actually, healthy glucose levels can surely be achieved by a right whole food diet with exercise and stress management. Because of low carbohydrate content in tomatoes, they can play a big role in our controlling blood sugar levels. And the low carbohydrate content can help lower calories intake plus help people with diabetes to lose their weight. All in all, tomatoes are good for diabetics.